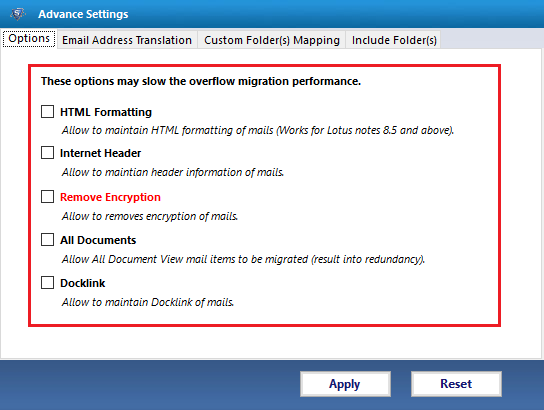 Using this Lotus Notes migration to Exchange software, the user can transfer Lotus Notes NSF to Live Exchange Server 2016, 2013, 2010 or 2007 mailboxes directly. To do so, Lotus Notes installation and Live Exchange Server environment is needed. An option to convert Lotus Notes to Exchange 2012, 2013, 2010, 2007 is provided for the user. This is best for the user as it simply exports Domino Server mailboxes to Exchange.To perform conversion, Live Domino and a working Exchange Server environments are required. 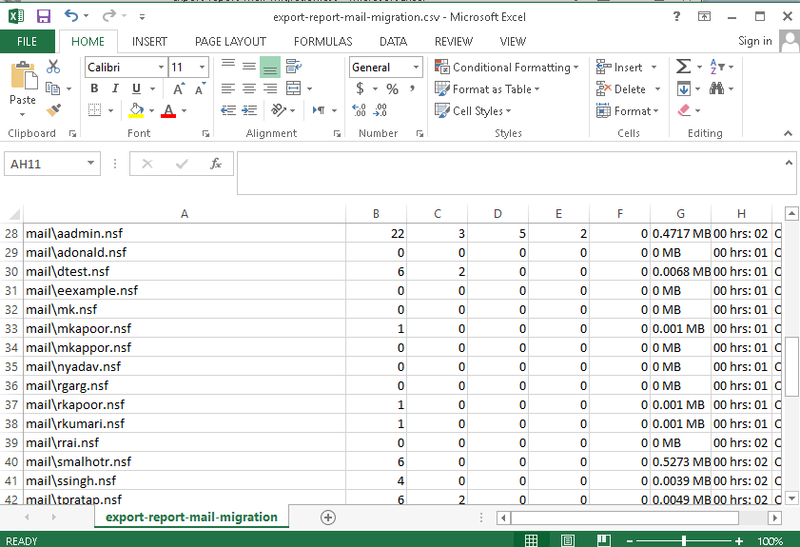 This tool can be used for batch migration of data also. However, you can use various filter options provided by the converter to migrate NSF to Exchange. By using email filter, calendar filter, and To-Do filter you can export only selected data from NSF files. The Lotus Notes to Exchange Server Converter tool removes any type of encryption applied in NSF email files. 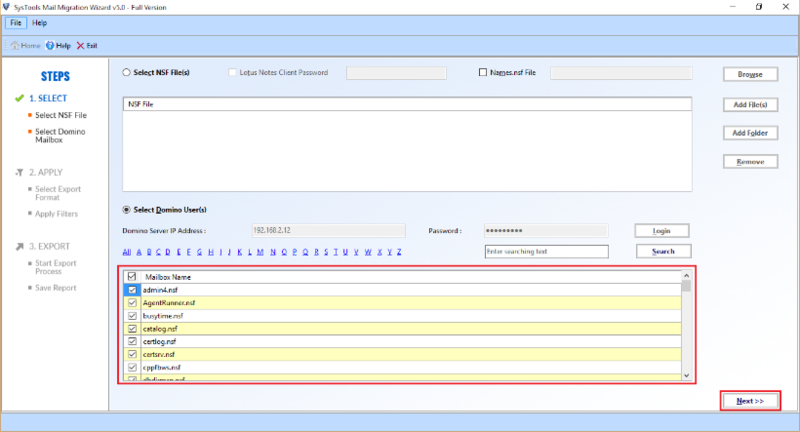 Through this optional feature, the user can select the required encrypted NSF file and then can perform export Lotus Notes NSF to Exchange process. This Lotus Notes migration to Exchange utility supports the option of calendar recurrence while moving the NSF data to Exchange. Different types of calendar recurrence like Yearly, Monthly by Date or by Day, etc. can be exported from source NSF to destination. This software is capable to find and convert the canonical name format set for any senders’ email address in the selected Lotus Notes Database. The user can set one SMTP name format for all the present canonical values or define the values for each individual in CSV file and then use it. There may be some contacts in the user’s list which might be stored multiple time, which the user does not want in the process to import NSF to Exchange. In these type of situations, the tool provides an option to exclude all duplicate contacts before the transferring process starts. This option helps the user in removing all the duplicate contacts and reduces the time of the conversion process. This Lotus Notes to Exchange migration tool can step by step convert multiple Lotus Notes NSF data files to Exchange 2016, 2013, 2010 or 2007. The software transfers the whole Lotus Notes database to Exchange Server in batches. It’s simple and user-friendly interface gives the user a continuous guide to migrate Lotus Domino to Exchange very easily. This conversion tool has been developed for complete export of NSF data to Exchange Server mailboxes. For the transfer process, either you can migrate all the items of NSF files in batches or select some files/folders using filters and then convert them. Every item present in Lotus Notes like emails, contacts, tasks, journals etc. are exported from Notes to Exchange. To launch the software, go to Start menu >> Programs >> Lotus Notes NSF to G Suite and then this screen appears. 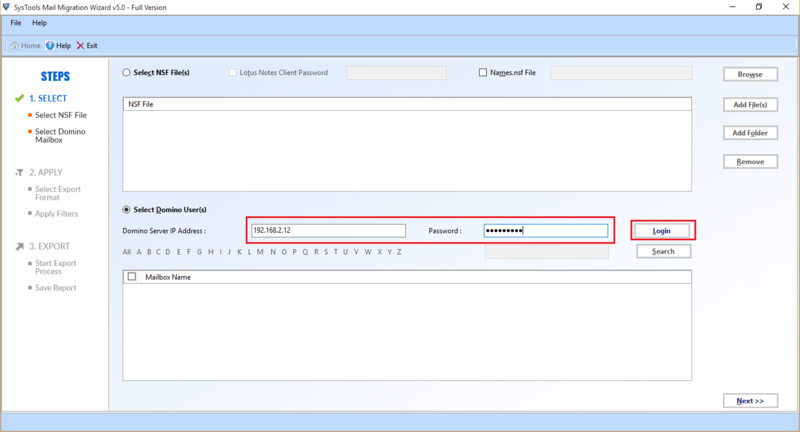 Provide the IP Address and Password to connect to the Domino Server, click on Login. The login process will start. All NSF mailboxes files present will be listed out. 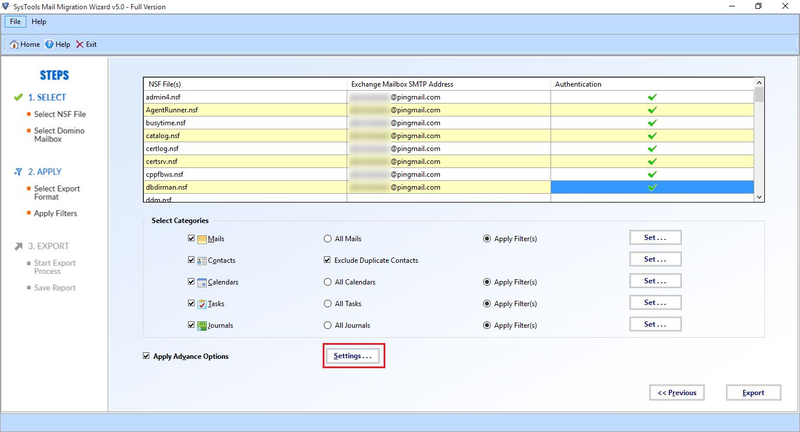 Select mailboxes to migrate NSF to Exchange and click on Next button. 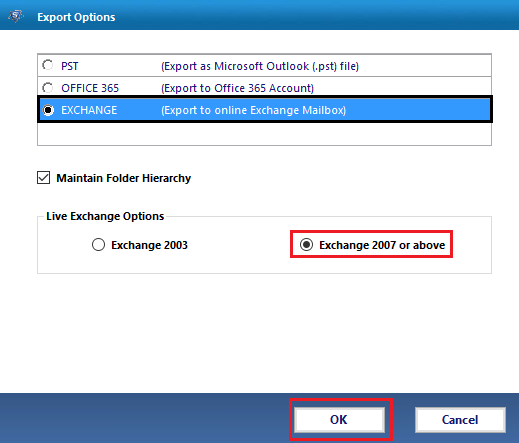 Select the radio button aside the EXCHANGE option, check to mark the box Maintain Folder Hierarchy such that the hierarchy remains the same after migration. Click on OK button. 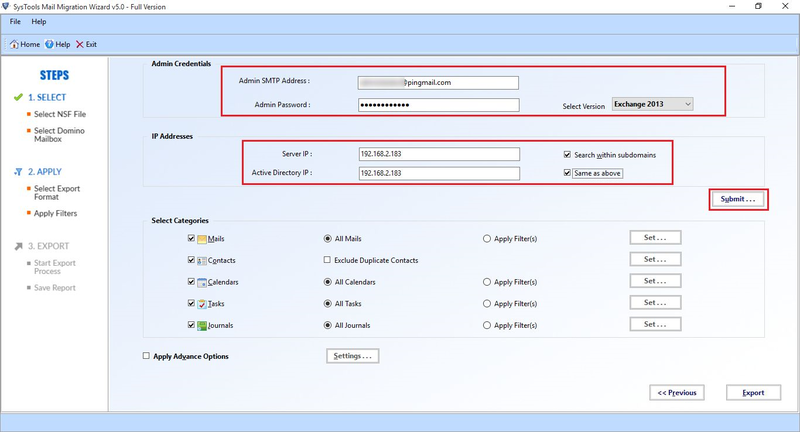 Provide the SMTP Address and Password and the IP Addresses for Server IP & Active Directory IP in the following fields and then click on Submit button. Provide the addresses against each file where the data is to be migrated. Apply filters for the exportation according to your requirements. 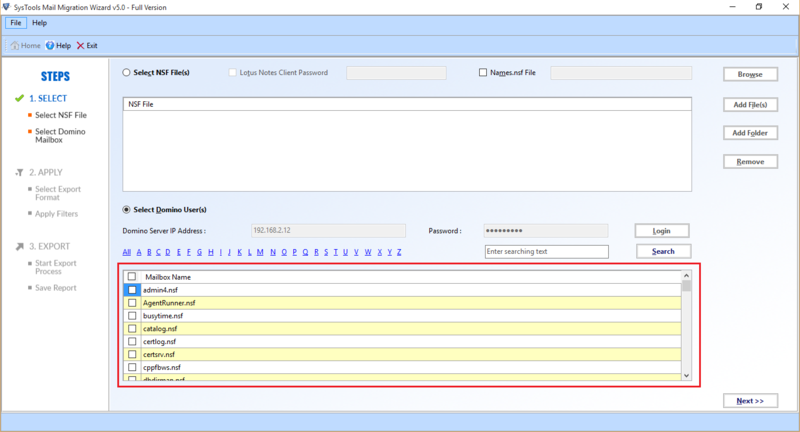 For example, Click on Mails and then choose the radio button Apply Filter(s) and then click on Set to apply the filters. Choose Apply Advance Options and then click on Settings button to select the required advance settings. After selecting the filters and settings, click on Export button so that the exportation process starts. After the process gets completed, click on Save Report to save the final report. The saved report can be viewed at the saved location. What are the main features of this tool? 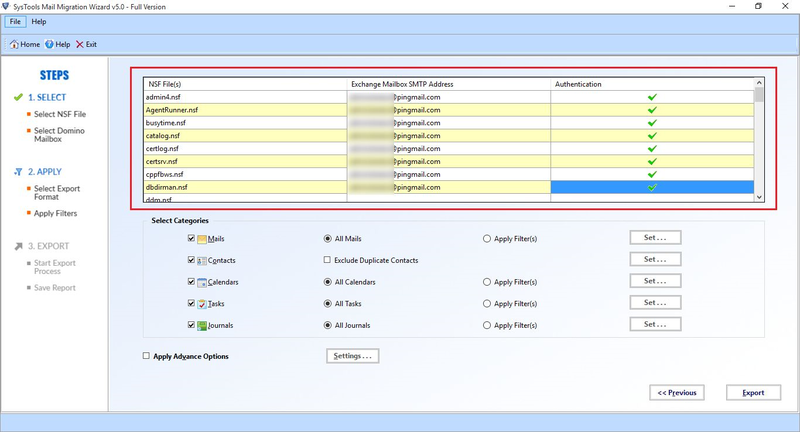 Add NSF files for Lotus Notes NSF to Exchange migration. 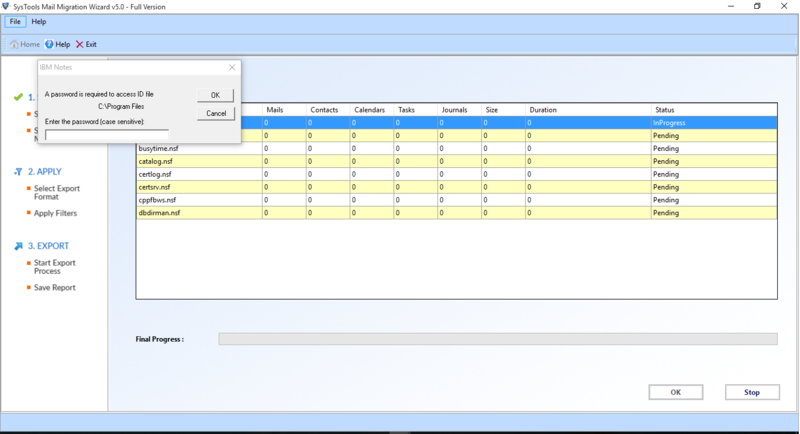 Moves data from Domino to Exchange. Option to choose Exchange versions. Have various filters to ease the migration process. What are the prerequisites for using this tool? 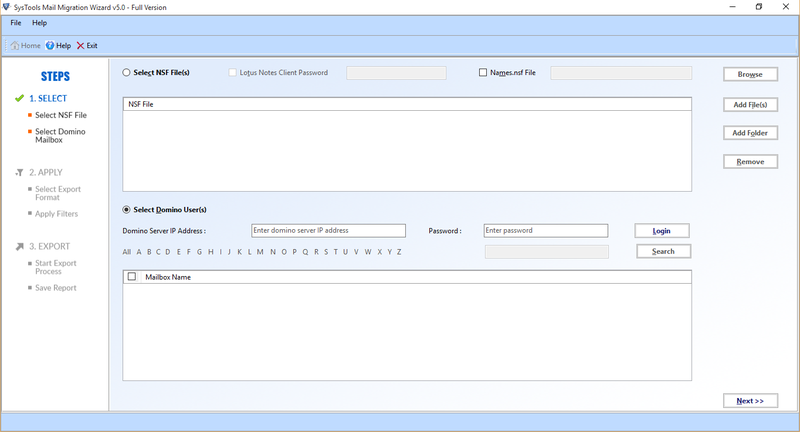 The system must have Lotus Notes Client installed and configured with Admin mailbox of Domino Server. You must have full admin permission on Domino mailboxes. Can the encrypted files be converted using this software? Yes, the software removes all the types of encryption on NSF data and then import NSF to Exchange. Will this tool be able to work on Windows 10? Yes, the converter can export Lotus Notes to Exchange in Windows 10 and all of its below versions. 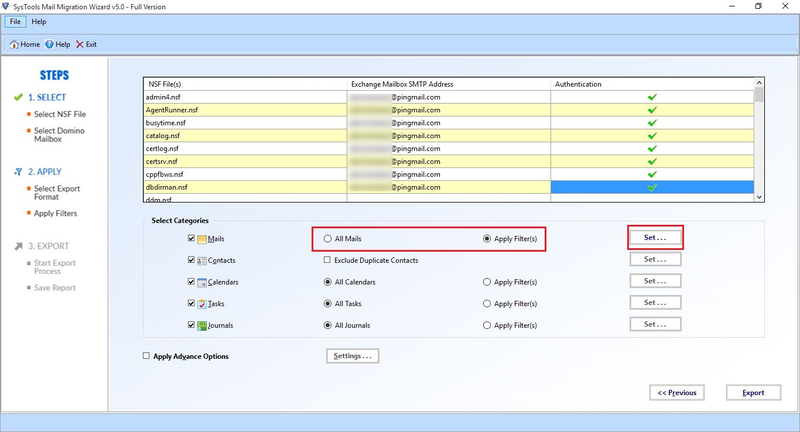 Can I migrate calendars from NSF to Exchange Server? Yes, the tool can migrate calendars from Lotus Notes to Exchange. 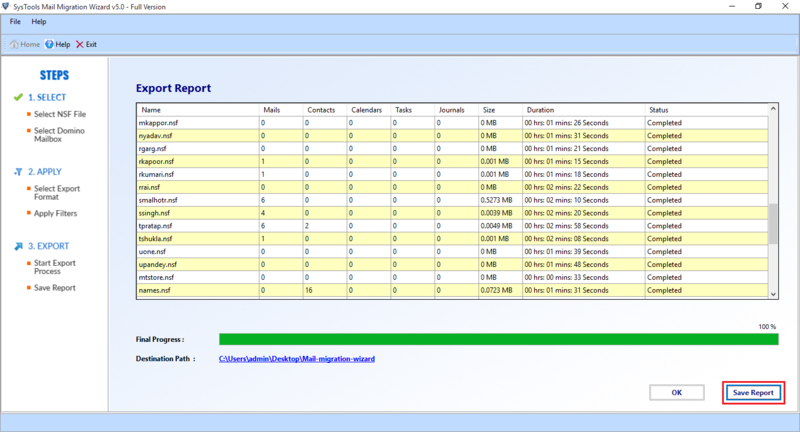 Moreover, the tool can migrate contacts, tasks, journals and all other items. Which all versions of Lotus Notes/Domino are supported for Notes files to Exchange migration? The process to Migrate Lotus Notes to Exchange can be done on all versions of IBM Lotus Notes/Domino.